The dark markings on the body are quite variable in size and shape. 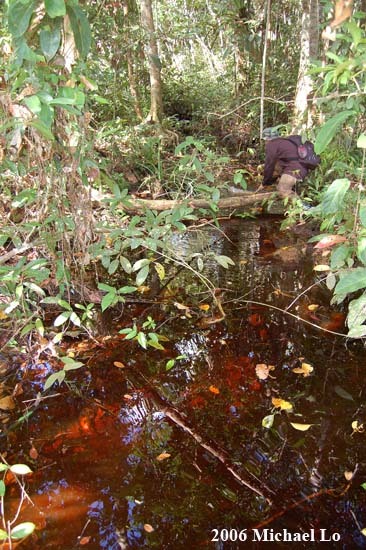 R. kalochroma was observed in this blackwater stream near the town of Lundu, southern Sarawak, Borneo. When an individual is stressed the dark body markings often fade. 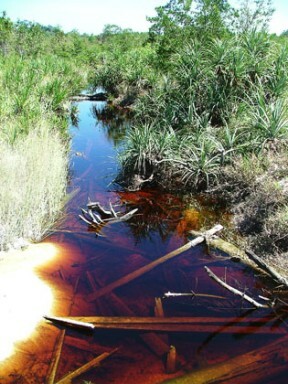 Another typical habitat of R. kalochroma is this forest peat swamp in the lower Batang (river) Samarahan area, western Sarawak, Borneo. Native to Peninsular Malaysia and the Greater Sunda Islands of Borneo and Sumatra. In Peninsular Malaysia it has been collected from the states of Selangor, Terengganu, Pahang and Johor so would appear to be widely-distributed. The only information pertaining to Sumatra we have are accounts from Gunung Sahilan in Riau province, Bintan Island in the Riau Islands province and Bangka/Belitung Islands just off the southeastern coast. On Borneo its range extends southwards from Kuching city in the Malaysian state of Sarawak via the Kapuas River basin in the Indonesian province of West Kalimantan (Kalimantan Barat) as far as the Barito drainage in South Kalimantan (Kalimantan Selatan). It does not occur in the north and east of the island. A good-sized adult can measure 4″/10cm. The addition of dried leaf litter (beech, oak or Ketapang almond leaves are all suitable; we like to use a mixture of all three) would further emphasise the natural feel and as well as offering even more cover for the fish brings with it the growth of microbe colonies as decomposition occurs. These tiny creatures can provide a valuable secondary food source for fry whilst the tannins and other chemicals released by the decaying leaves are thought to be beneficial for blackwater fish species such as this. Certainly R. kalochroma is known to display more intense colouration in tannin-stained water. Leaves can be left in the tank to break down fully or removed and replaced every few weeks. 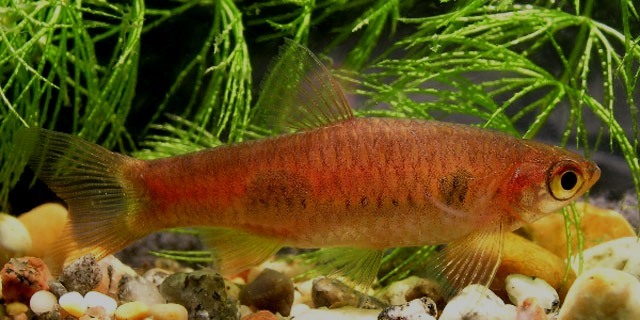 This species is very peaceful indeed making it an ideal resident of the well-furnished community tank. As always when selecting a compatible community of fish proper research is essential and its adult size must be a consideration. A community based around one of its native countries or river basins would also make a worthwhile project with some interesting alternatives. 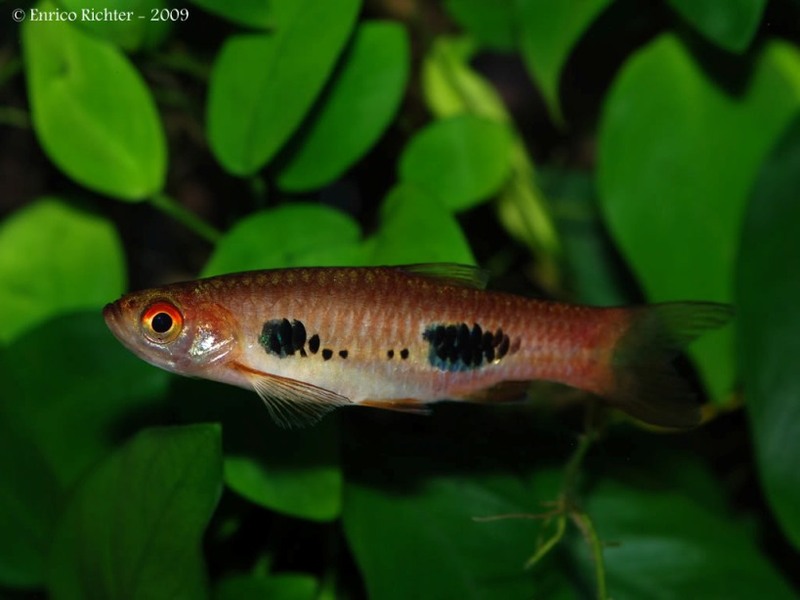 For example in blackwaters of the Endau river drainage, Peninsular Malaysia sympatric species include Rasbora cephalotaenia, R. einthovenii, R. dusonensis, R. paucisqualis, Brevibora dorsiocellata, Trigonopoma pauciperforatum, T. gracile, Puntius johorensis, P. partipentazona, Betta pugnax, Sphaerichthys osphromenoides, Vaillantella maassi and seven species of Pangio. Despite reports to the contrary this is a schooling fish and at least 8-10 specimens should be purchased with problems only likely to occur if the fish are kept in cramped conditions or insufficient numbers. Maintaining it in a decent-sized group will not only make the fish less nervous but will result in a more effective, natural-looking display. Males will also display their best colours as they compete with one other for female attention and any aggression ought to be spread out among the group. However if you want to increase the yield of fry a slightly more controlled approach is required. The adult group can still be conditioned together but one or more long, shallow, say 30″ x 12″ x 12″/75cm x 30cm x 30cm/71 litre containers should also be set up and half-filled with water. These should be very dimly lit and the base covered with some kind of mesh of a large enough grade so that the eggs can fall through it but small enough so that the adults cannot reach them. The widely available plastic ‘grass’-type matting can also be used and works very well with the addition of a few clumps of java moss or other fine-leaved plant also highly recommended. The water itself should be of slightly acidic pH with a temperature towards the upper end of the range suggested above. A small power filter can be added initially and this should be positioned so that the flow is directed down the full length of the tank. When the adult fish are well-conditioned and the females appear full of eggs one or two pairs should then be introduced to each container. Spawning can be initiated by adding small amounts of cool water every few hours in such a way that the tank is gradually topped up and feeding small amounts of live and frozen foods. Several spawning events will usually occur before a female is spent of eggs. R. kalochroma exhibits variable patterning across its range according to locality with some forms possessing a line of spot-like markings connecting the two dark blotches on the flanks and others more intense body colouration. Juveniles are sometimes confused with Boraras maculatus and adults with the similarly-patterened R. elegans although the latter is easy to identify by its overall silver, as opposed to pinkish/reddish, colouration. The only congener for which it may be genuinely mistaken is the almost-identical R. kottelati which has a restricted range and is found only in northern Sarawak and Brunei Darussalam, Borneo. It possesses an additional, oval-shaped dark blotch on the caudal peduncle, lacks the stripe in the middle of the caudal fin seen in R. kalochroma and is consequently easy to distinguish on close inspection. It is thought that the two derived from a common ancestor but are now separated by the western tip of the Kapuas Hulu mountain range. When describing the species in 1995 Kelvin Lim noted that it was more difficult to positively identify populations of R. kalochroma from Borneo, Sumatra and Peninsular Malaysia from one another than R. kottelati. No specimens of either species used in the study were found to have intermediate patterning which further suggests they do not occur sympatrically in nature and are genetically distinct from one another.